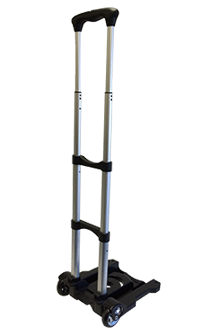 Folding Luggage Cart with telescoping handle. Sturdy, light-weight Folding Wheeled Cart. Opens and closes in seconds providing easy transport of your BrightLine Bag and oversized rugged wheels for improved handling. Adjustable support strap anchors bag and prevents shifting. Safely transports a variety of BrightLine Bags configurations up to a maximum approved transport capacity of 32kg / 70 lbs. Comes with two elastic cords with plastic hooks.